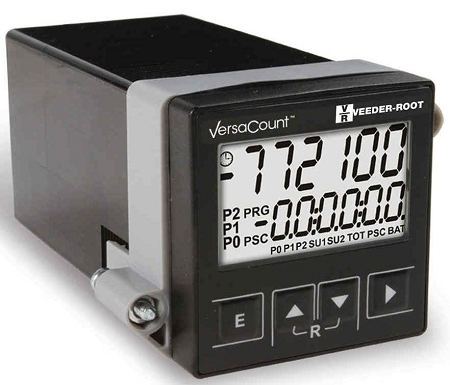 The Veeder-Root VersaCount 1/16 DIN size multifunction counter is the most versatile counter on the market today. Whatever your application, timing, counting, rate measuring, position indicating, volume measurement, speed controlling, length cutting or batch, shift, pulse or piece counting, the VersaCount is the only device you need. Versatility doesn’t stop with functionality. The highest count frequency in the industry enables the VersaCount to perform in applications not previously possible with an electronic counter. What would speed be without accuracy? That’s why the VersaCount features an unprecedented prescaler accuracy to one ten thousandth. Further, automation and precision control are achieved using three presets with signal times programmable up to ten minutes.